I was completely unprepared how much I enjoyed this novel: with a synopsis that just screamed out to be read and themes that mix lighthearted humor, self-discovery, a ‘Cuckoo’s Nest’ like mental hospital and plenty of revelations. Death appears to be a mid-twenties young woman, pale, pretty and very much dedicated to her job. She has a purpose, and thinking further than that isn’t really necessary. Until she tries to use her ‘power’ to take another soul, and wakes face down on the carpet in a flop-house next to a failed suicide. Far from being a simple ‘how she got back’ story, the road for Death to regain her place in her own realm is not a smooth or easy one. With sense and feeling that reminded me of ‘It’s a Wonderful Life’, there is a series of lessons that she must learn about herself, her purpose and the ultimate preciousness that is the gift of life. While she starts her story believing that her purpose is simply that and emotion and regret are wasted – her purpose is clear and anything more isn’t necessary. From her introduction (and acceptance) by a few kindly people (Angela, Randy and Curtis) the frustration in trying to find answers from Pestilence (also a patient in the hospital) and the clear protagonist in Dr. Vaughn, the man who is determined to ‘break her’, she learns to function in the society presented to her, manipulations, escapes and deceptions (all new) as she has opportunities to grab for joy and fun along the way. With an interesting twist at the end as she learns the purpose of her ‘time as human’ and some truly sweet moments that give proof to the ‘life is a gift’ premise – the story is clever, easy to read and fully engaging. Baron’s writing style is smooth and descriptive, while some of the more emotional components are a bit stilted (much like Death’s itself) as the story progresses they become more tangible. I’ll admit that I was concerned with Baron’s screenwriting history as my experience with books from screenwriters have been problematic and often over-worked, Baron has the ability to convey description, emotion and action without overstep – giving the reader cues to visualize rather than directing the scenes. Want something different and quirky? This is the book for that, leaving you with plenty of unexpected and unforeseen smiles. Wearing nothing but psych ward pajamas and fluffy slippers, the odd girl wasn’t really dressed to kill. 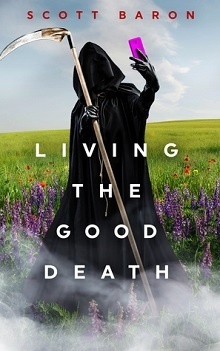 Being the Grim Reaper, however, she felt confident she could make it work. Have you ever had one of those days? You know, the kind of day when things just don’t go your way. Like when your botched suicide attempt and claims of supernatural powers get you hauled to the emergency room, placed under observation, then transferred to a locked-down psych facility. The situation was, well, grim, to say the very least. An irony not lost on the girl claiming to be the Death. Scott Baron is an American author with a penchant for oddball stories with O. Henry-esque twists. Born in Hollywood, Baron credits growing up in Los Angeles with skewing his humor towards the offbeat and absurd. He studied abroad in Italy during his college years, returning to Los Angeles to work in the film industry as an on-set medic. In addition to writing shorts and novels, Baron is also a screenwriter of both feature and television scripts.